i have been in bed since around seven this evening, under the fluffy down blanket, with my feet pressed up against the hot water bottle, and two-out-of-three cats fast asleep next to me. i am on the threshold of something great—headache-wise, that is—so i have decided to call it an early day. it dawned on me as i was contemplating how to wrap up the last two days of my "twelve days of..." posts, that i never documented the last two garments i completed during last year's marathon-o-knits, mainly as i took a long break from my blog (and from knitting) near the end of the year. following last Summer's uncharacteristic foray into the world of pink, i was happy to finally get back to life in many shades of grey (and blue). 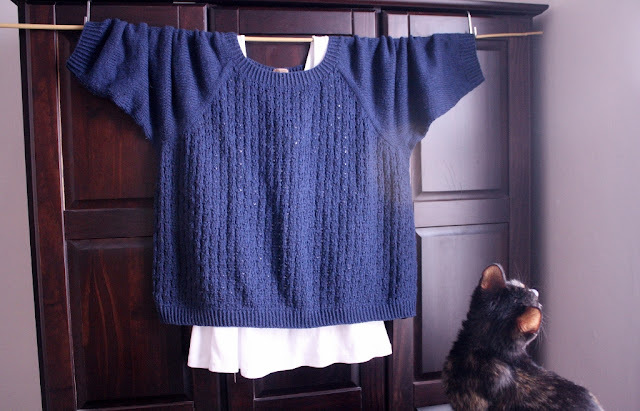 in addition to the squishy Wonder Woman shawl, i completed a really posh cardi for him (more about that next time... maybe), then there was that really lovely, lacy, navy blue sweater from me. 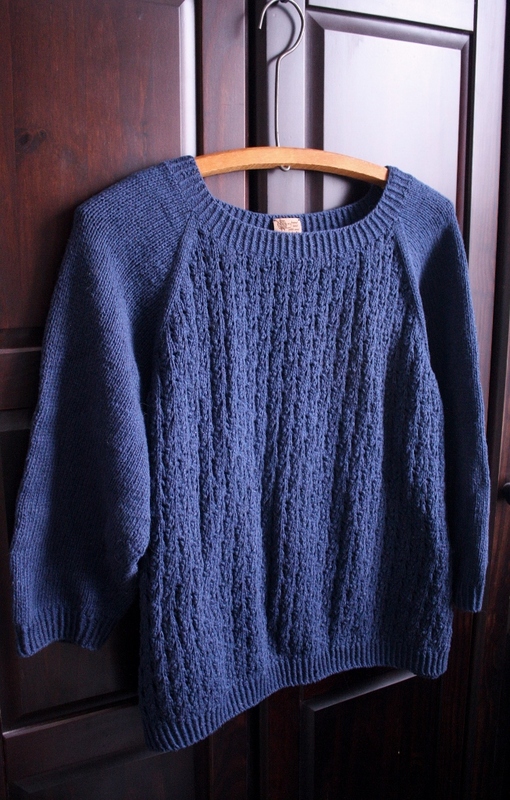 it is slightly-cropped, slightly-boxy, with slightly-shortened sleeves. basically.... slightly-everything. the pattern was written for four separate pieces (front, back, and two sleeves) worked from the bottom hem up, then seamed together, and a collar added to form the completed garment. i had zero time for all that foolishness, so i did my own (lazy) thing. i tend to avoid seaming whenever possible, so the first step was to reconfigure the pattern to be knitted seamlessly, in the round. then there was the other problem. 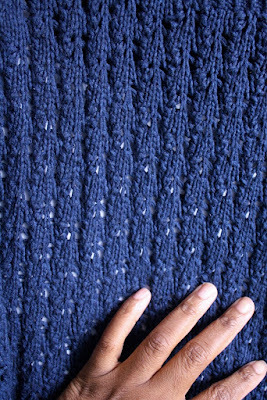 knitting a sweater in the round from the bottom-up usually means beginning by knitting two tubes for the sleeves, up to the armpits, then a larger tube for the body up to the same point, then you arrange all three tubes together, and continue knitting around one large circle (minus the armpit stitches), shaping the shoulders as you go, until you arrive at the collar... then you are done. 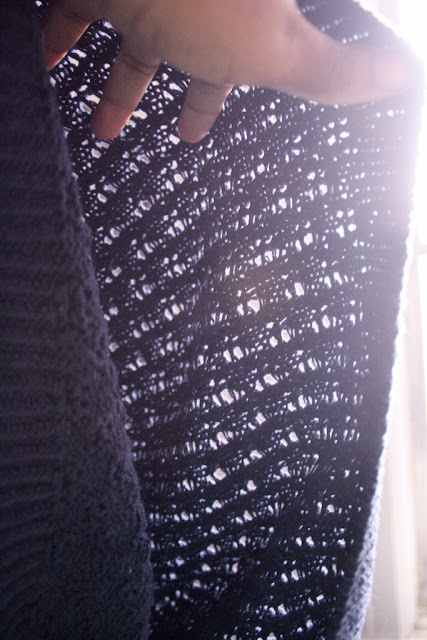 and that works if you know that you have enough yarn to spare, but when you are cutting it close (which i most definitely was with this one), it is heart-wrenching to get halfway through the shoulder, then realize that you do not have enough to go the whole way. there are quite a number of unfinished bottom-up sweaters lurking out there, with owners who could not bring themselves to unravel all of that hard work. enter the top-down sweater. start at the collar, and work your way down. if it looks like you might run out of yarn, you can adjust appropriately. wrist-length sleeves can be easily shortened, as can the central body of the garment. 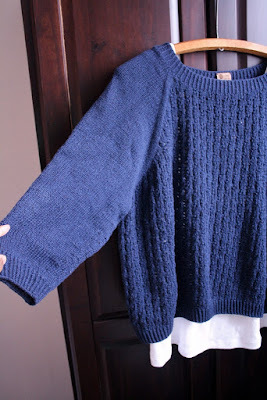 what you hoped would be a hip-length, wrist-warming sweater, is now a slightly-cropped, bracelet-length layering piece... and you are left with a meter or two of yarn to spare. i am genuinely proud of myself at these moments, and i appear to have company on that front (she was actually looking at the birds in the tree). him: so, you basically re-wrote the whole pattern? him: why did you bother buying it in the first place? me: i'm still asking myself that question. the sweater features an all-over lace stitch in the body, with plain (stockinette) sleeves. 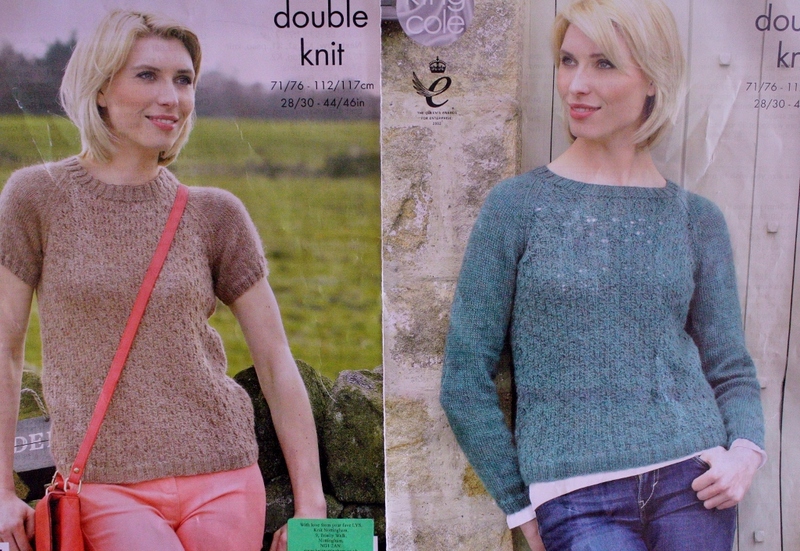 the lace (naturally) means that it is a layering piece... unless you like to live adventurously. i even dug up the cute little labels i purchased for such an occasion, as they provide that extra little touch to let me know that a project is finally finished. the pattern was King Cole #4269, which was my very first experience with this company's designs, although i know that they are a major design house in the UK market. it was one of two patterns i purchased from Knit Nottingham, and i only bought this one because it felt like i would be wasting their time just ordering the one other pattern that i really wanted (i have yet to even look at that one). the original pattern had a long and short option for the sleeve... naturally, i went with option "c", ending up with something in-between. this was my first real attempt at using a cotton-based yarn for a Wintery garment, as i tended to associate said fiber with warm-weather knitting. fast-forward a few months, and my stash has almost doubled with the subsequent purchase of cottony things. 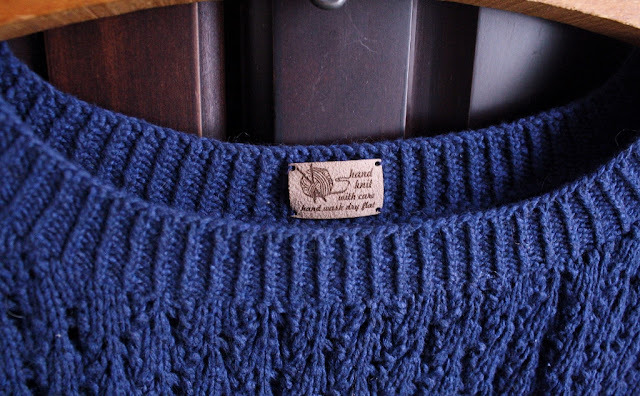 the realization that i can still indulge my love for wool by making stuff for my favorite animator, my mom, and his, while making cotton-based garments for myself that i will actually be able to wear (without breaking out in hives, that is) has absolutely renewed my enthusiasm for the craft. i am back to the point where the hardest part of finishing one project is deciding which one to cast on next. i want to knit everything... except socks. sorry, sweetie.